With worries cast aside, the Summer Queen has time for play. She has decorated the forest with dainty, whimsical and just plain weird creations. Sounds like the perfect time for forest dwellers to seek out the Queen’s works of art. Sounds like the perfect time to go mushroom hunting! 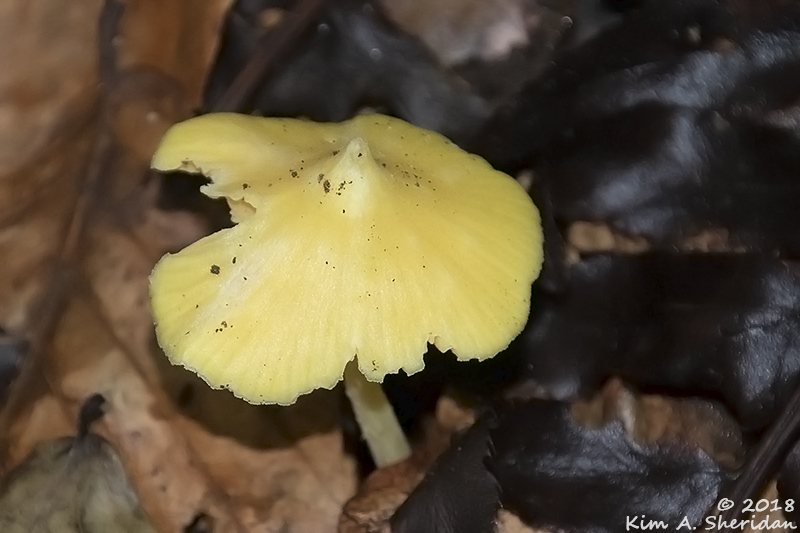 The First Rule of Mushroom Hunting: DO NOT EAT IT IF YOU DON’T KNOW WHAT IT IS! Here’s why. Looks like your typical toadstool mushroom, a shelter for one of Her Majesty’s small footmen. 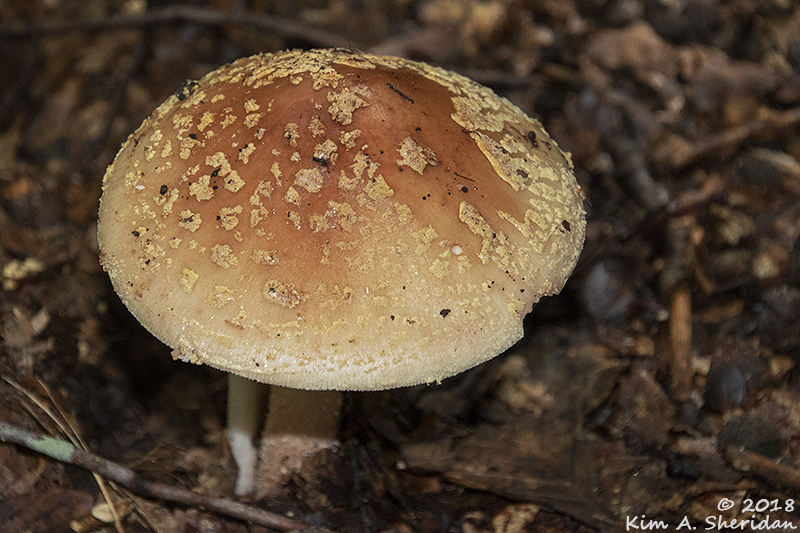 It’s an Amanita, one of a genus of VERY toxic mushrooms. There are edible mushrooms in the woods, but this isn’t one of them. Look, but don’t eat. That’s the wise hunter’s rule for ALL mushrooms in the wild; better safe than sorry. Suddenly, little pink fingers thrust up from the grave, grasping at feet and ankles! RUN! Hide! HA! The Summer Queen has a dark sense of humor, and this is one of her tricks. 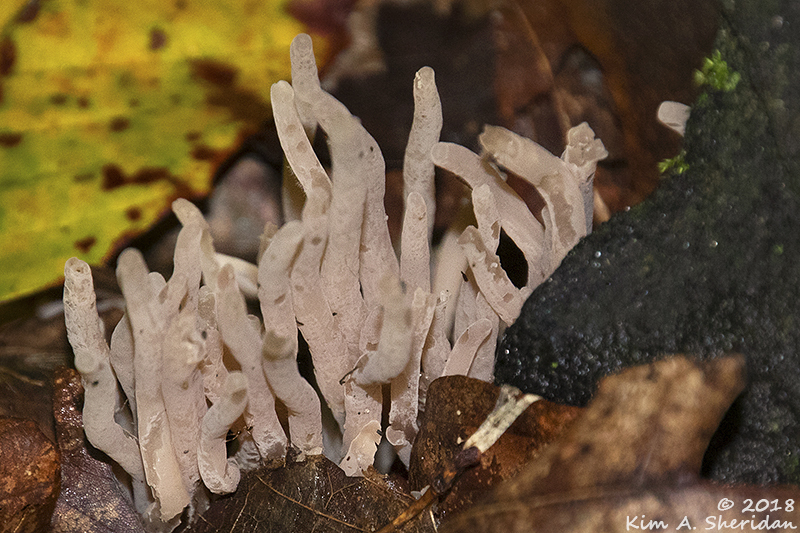 She knows this is a species of Coral Mushroom, not the hands of the dead. But who fell for her joke? Apparently Madame Witch did. In her hurried retreat, she left behind her Cap. 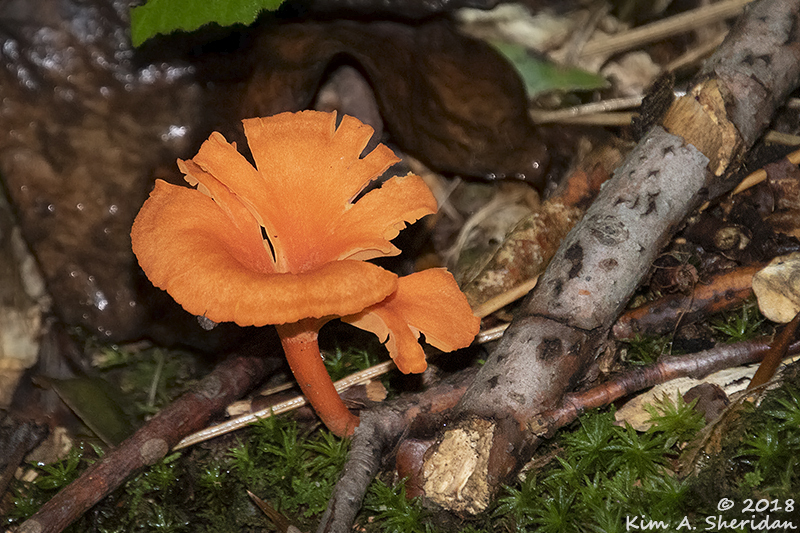 Orange Mycena huddle together on a leaning branch. Strength in numbers. 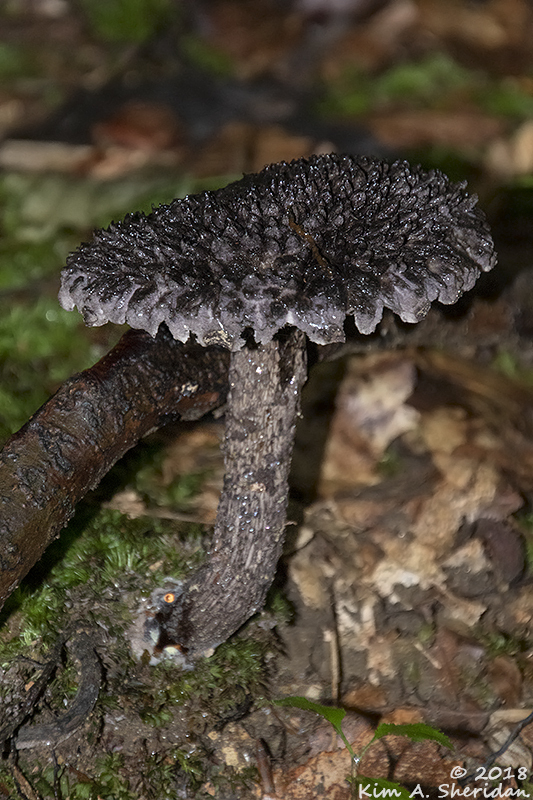 The Old Man of the Woods is not fooled. With great age comes great wisdom. He has been the Queen’s confidant for many a year, and understands her ways. 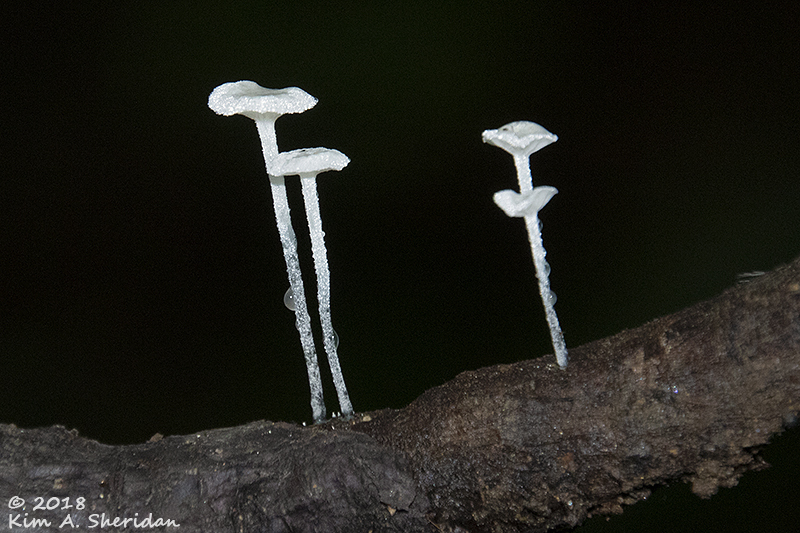 FUN FACT: All mushrooms are fungi, but not all fungi are mushrooms. 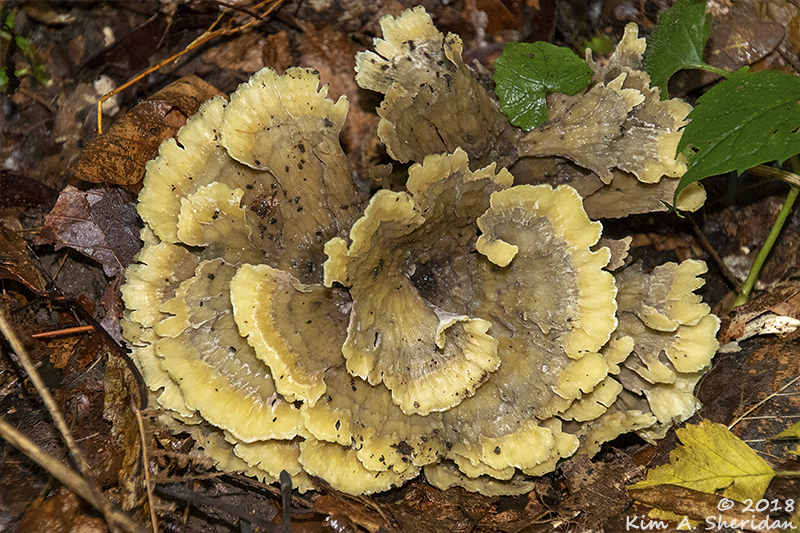 Fungi have a kingdom all their own, separate from plants and animals. The group includes tiny organisms like molds and yeasts. A mushroom is the fruit of a fungus, the visible body that produces spores for reproduction. Beneath the ground is the mycelium, a mass of threadlike strands or roots that can spread for acres. The mycelium is responsible for growth, and for the absorption of nutrients. Thus fortified by her mycelium, a Red Chanterelle bravely stands her ground. Mushrooms are decomposers, breaking down organic matter. They may be found growing from the soil, or on rotting wood above or below ground. Some grow in a circle, feeding on the buried roots of a long-gone tree. A Faerie Ring, where pixies gather. Alas, the faeries fell victim to the Summer Queen’s little prank, and scattered, leaving their umbrellas on a branch. Umbrellas being a necessary accessory in a rainy season such as this. The faeries quickly regain their composure. They were not amused by the joke, and blow raspberries at Her Majesty behind her back. 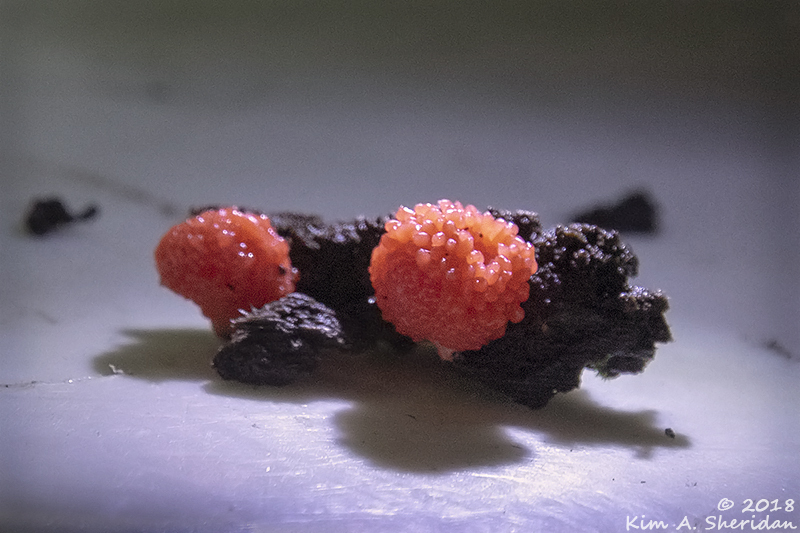 When she turns to face them, they scatter anew, but she sees the evidence of their insolence: Raspberry Slime Mold. FUN FACT: This isn’t a mushroom, or even a fungus. 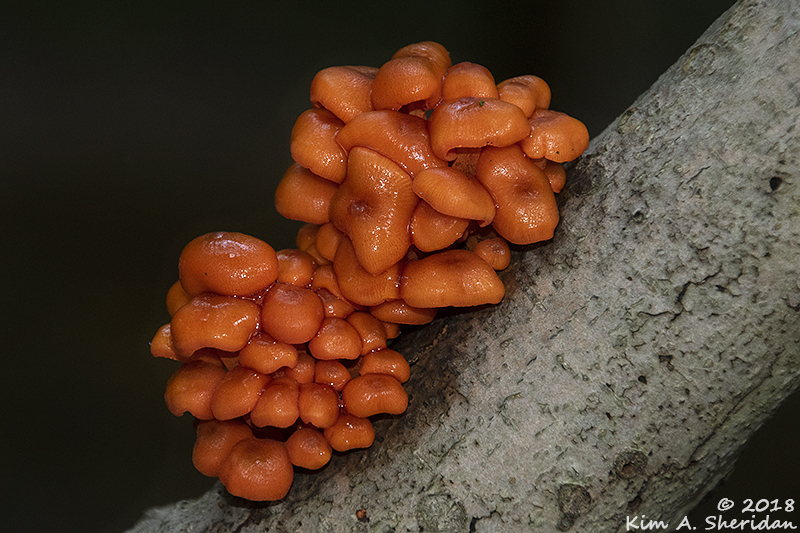 Slime molds are single-celled organisms that under the right conditions form masses of protoplasm capable of movement to feed. At some point, sporangia form. That’s the sporangia, or the fruiting body, that you see here in the artificial glow of a magnifier light. The Summer Queen has a sense of humor, but she also has compassion for her small subjects, and soon feels regret for frightening them. Here, a peace offering. 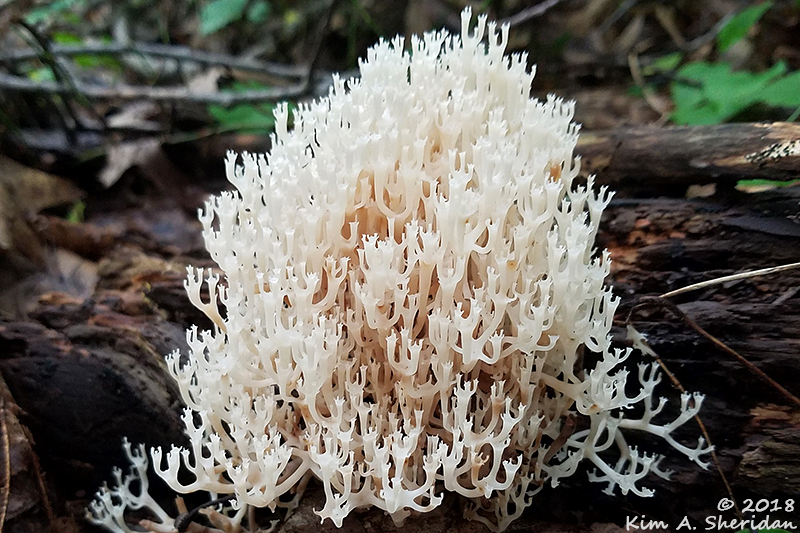 This regal beauty is a Crown-tipped Coral Mushroom. Her Majesty’s subjects gather round in awe, witches and footmen and faeries alike. More oohs and ahhs. Look there! Trees drip with white stalactites. 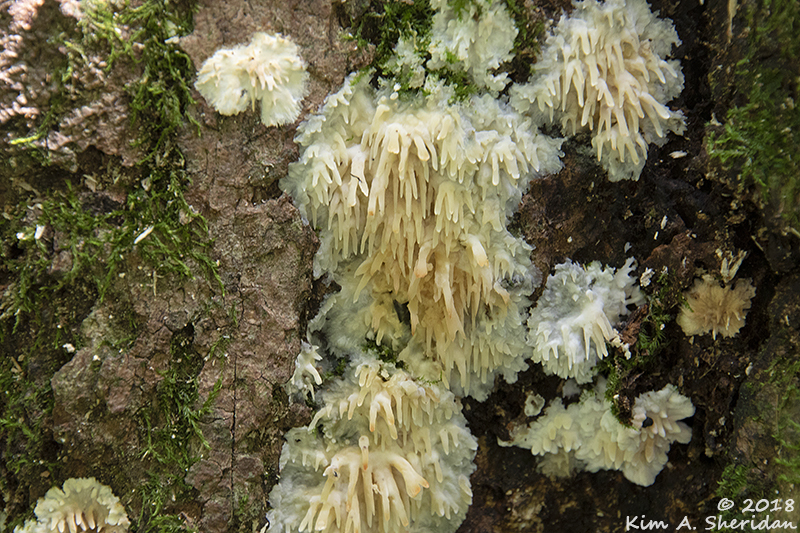 These are the Her Majesty’s icicles, a fungus called Lion’s Mane. 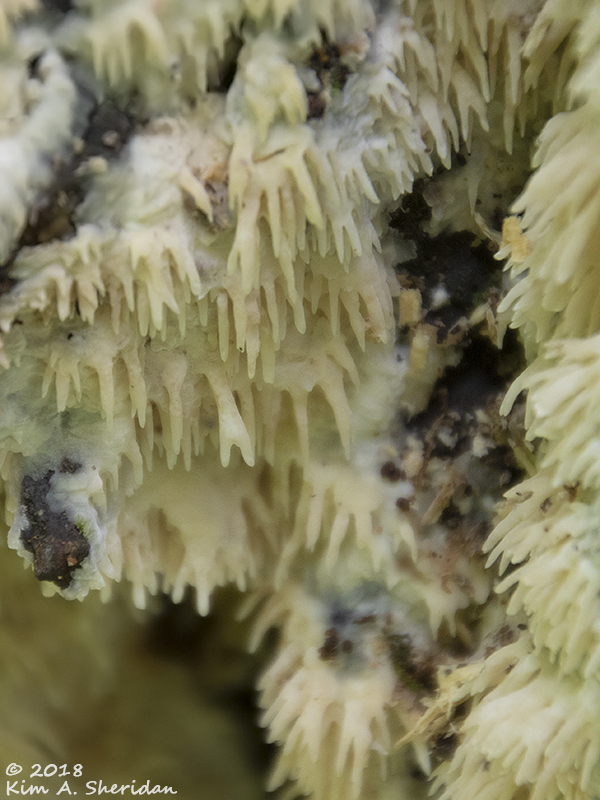 Made of rain and soil and decay, each mushroom is a unique and delicate creation. Give thanks for the stormy skies and the wet days. Give thanks for the artistry of the Summer Queen when she is free to play, to create. Give thanks for fun with fungi. 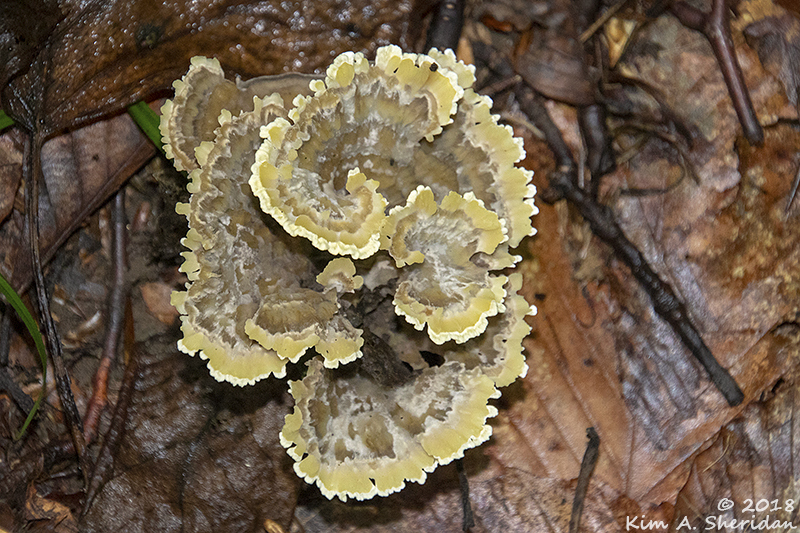 This entry was posted in Court of the Seasons, Nature and tagged Fungus, Mushroom, Nature, Tyler Arboretum by Kim. Bookmark the permalink.